Here at Garvin’s, we’ve always been plumbers. After all, it’s a family-owned business and has been passed down through three generations now. We grew up knowing what will and won’t work on a simple drain clog, and since we have the professional equipment we’ve always been able to take care of our own home plumbing and sewer system. That’s not true of our customers, and we do our best to understand when someone comes to us and tells us the wacky thing they’ve tried to do to clean out their pipes before we got there. Here are a few home remedies our customers have tried that turned out to cause more harm than good. You wouldn’t take a coat hanger and start poking around under the hood of your car. You wouldn’t take one and ram it into your house’s electrical box. So why do some people think that it’s perfectly acceptable to try to get rid of a clog with one? When you use a piece of metal like a coat hanger that isn’t made for the job you’re more likely to damage your pipes and your sink’s plumbing. Not only that, but it probably won’t work, because what you’re dealing with isn’t a solid mass as you might imagine it, but a collection of grease, hair, and food particles that aren’t so easily dismissed with a pointy object like a hanger. Well this is a fun one. Some people, realizing that a professional drain cleaner sometimes uses a water jet to clean the pipes, have actually tried to use pressurized water to get rid of their clogs. Their first thought was to open the window, take off the screen, and pull the garden hose into the kitchen. You can probably imagine that this is a bad idea. First of all, they couldn’t get a firm seal over the sink, and that leads to water being sprayed everywhere. And not only water, but whatever else was floating just above the clog, so it got gross fast. 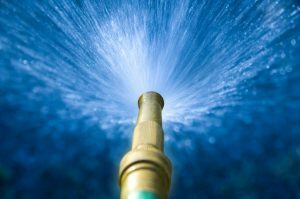 Plus, a garden hose just doesn’t have the PSI of water pressure that a professional unit has. It was even worse, though, when they did get a solid seal over the drain. The pressure would build for a fraction of a second, but the clog would hold. When that happens, the hose is going to fly off out of the sink and smack anyone standing near. It’s been a couple of months since we’ve railed against drain cleaners, so we figure it’s about time! We hate chemical drain cleaners. They seldom work, and even when they do they punch a very small hole in the clog and then drain away, leaving the remainder of the clog to repair itself in a short time. Drain cleaners are dangerous to keep in your home, and also dangerous to the next person who performs professional drain cleaning if they stick around. They’re harsh on your drain pipes, and they’re bad for the environment. Just say no to chemical drain cleaners! Bleach is pretty amazing, we’ll admit. After all, nothing in the world can ruin your clothes and blind you faster! The problem with bleach (much like the drain cleaners mentioned above) is that it’s very caustic when concentrated and ineffective when it’s not. So, much like drain cleaners, it’s just not going to work. Even more, it could damage your sink basin and metal components, and will be cause potential health hazards if it sticks around in your pipes for too long. We’re not saying that you shouldn’t give simple drain cleaning a try before calling us. After all, a simple sinks-only plunger can do wonders and save you a lot of money. But if that doesn’t work, you should probably give a professional plumber a call. Contact Garvin’s when your drains are clogged!